Update on New Years Resolutions: -I can't believe I've actually been doing this for a month now. So hoping that I don't run out of ideas. Just in case though if you know of a crafty type tutorial you'd like me to check out post it in the comments and I'll do that as one of my days things. -As far as the whole diet/exercise thing goes...well I've lost 5 lbs so far. :) But...the exercise is a tough one. It's cold outside, the ground is mushy, and there's still some snow on the ground. (yeah I know, excuses, excuses..) I've been doing the weight watchers thing and I have to say that it's nice to be able to eat whatever with in reason. For instance I blew all my extra point for the week and part of the days on the dirt bomb the other week. This week I don't know what I'll do with them. 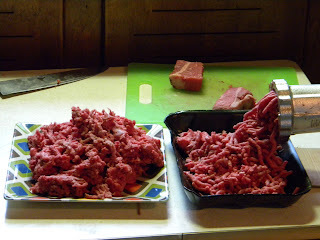 I should start posting some of the really good recipes that I've been using (with modifications). -I'm adding on another resolution (better late than never.) I want to purge my house. I want to get dumpsters or start filling up my two tipper barrels. I want to go back to minimalist living, only keeping what we use. I think there might be some good yard sales and donations box trips in my future. Right now I'm wishing that I could find some nice 7" square plates. We find that those work best for dinners and portion control. There seem to be few and far between. I don't want to go out and buy sets of dishes just for the 7" plates as I don't need anything else in the sets. I'll have to keep my eyes peeled. Do you remember making friendship bracelets? I do. I can't seem to remember how I came about knowing how to make them, I'm thinking summer camp, I just remember making them. My friends and I would spend hours making them. We would make them at the beach, sitting in front of the t.v., and in study hall sometimes. It was fun to see all the different designs everyone came up with and the different color combinations. We would make them and exchange them. 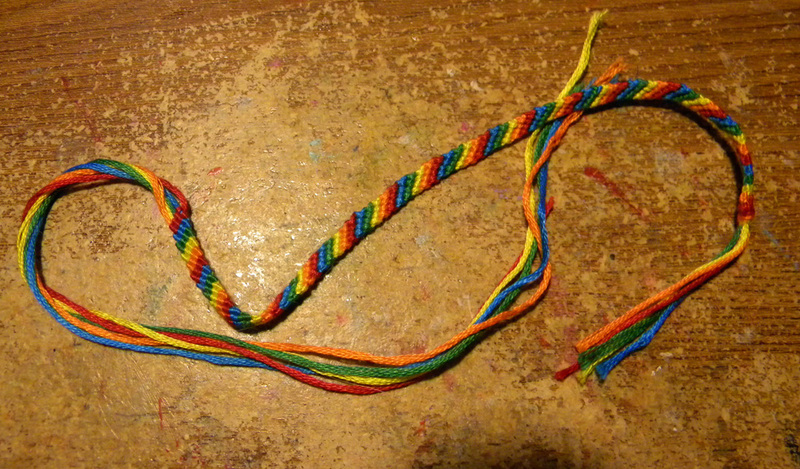 I think I always had one on either my ankle or wrist. Thankfully the embroidery floss used to make them was cheap and you could make lots with them so it was a cheap little craft for me to do when I was younger. 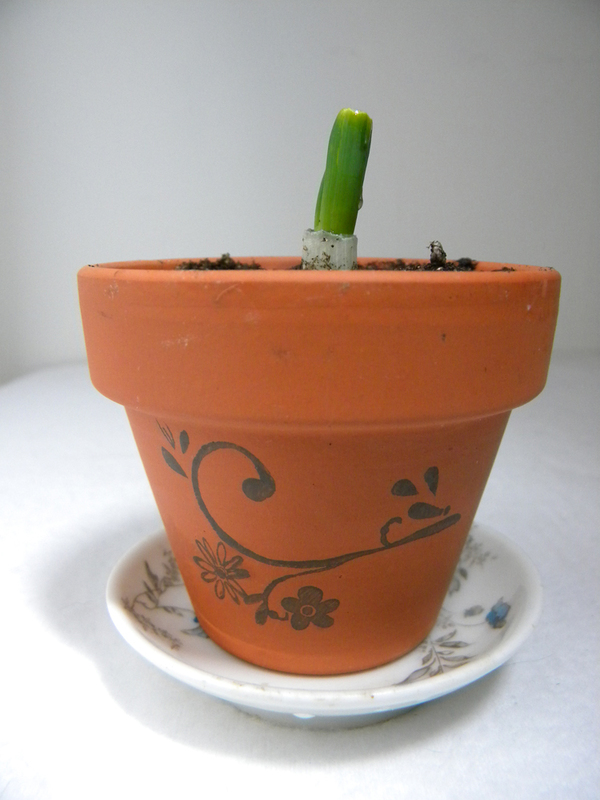 I planted my green onions today into some little terracotta pots. I hope that they grow okay in them for now until it's nice enough to plant them outside. The terracotta pots are nice because you can do so much with them to dress them up. 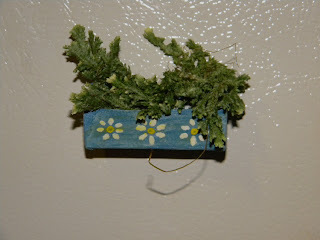 I took these little pots that I had, some archival waterproof archival ink and a stamp and made a lovely flower pot. I stamped the image on both sides of the pot and put it on a little dish. Today is not so much about what I did today but what I have been doing and am finally done with. 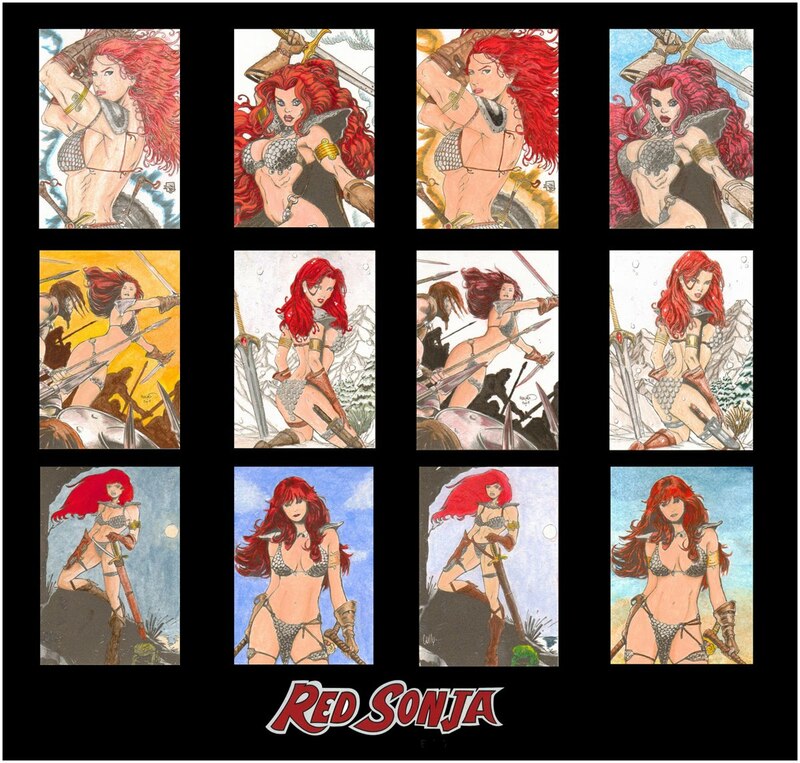 I just finished coloring/painting some of the Red Sonja line art cards for Breygent Marketing's upcoming Red Sonja set. It was my very first time coloring line art trading cards. I'm used to coloring line art on a much bigger scale. They were fun to do. I started off and colored some in colored pencils using a variety of Prismacolor and Design colored pencils. I have to say that I love the Design so much and wish they still made them and in many more colors. I especially love the flesh tones Design made. The Prismacolor pencils are the closest I've been able to find to the Design and come in a great variety of colors. Quite a bit of the cards that I colored were painted with a mix of acrylics used like watercolors and actual watercolors themselves. I loved painting the cards. I found these paints by Golden® that are called Fluid Acrylics and they are amazing. I love the transparency they offer and still keep the colors bright. They also have ones that are called Interference that are able to be translucent almost to the point of being clear but offer a sheen of metallic color when in light. I have the gold and love it. 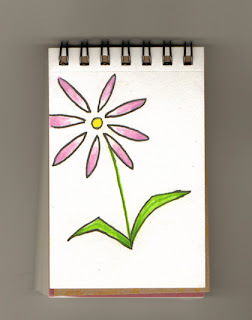 I can use it over yellow colored pencils for shading and get a gold sheen by using it over the colored pencils. I also bought a iridescent silver which is great as well. I'll be looking to pick up more of these as I can in the future. Day 27 - Green Onions and What to use on Black Cardstock. I came across this video thanks to CFRM. I of course had to check this out and see if this was in fact true. The whole thing seemed kind of weird to me. I'm use to cutting the top off something, ie pineapple, and rooting that or rooting branches, as in having things grow roots not having roots grow things. Could this really be possible? 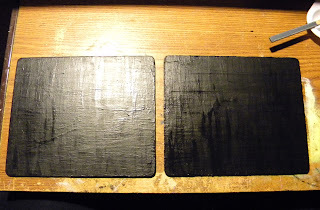 Back to the chalkboard book and the black card stock. 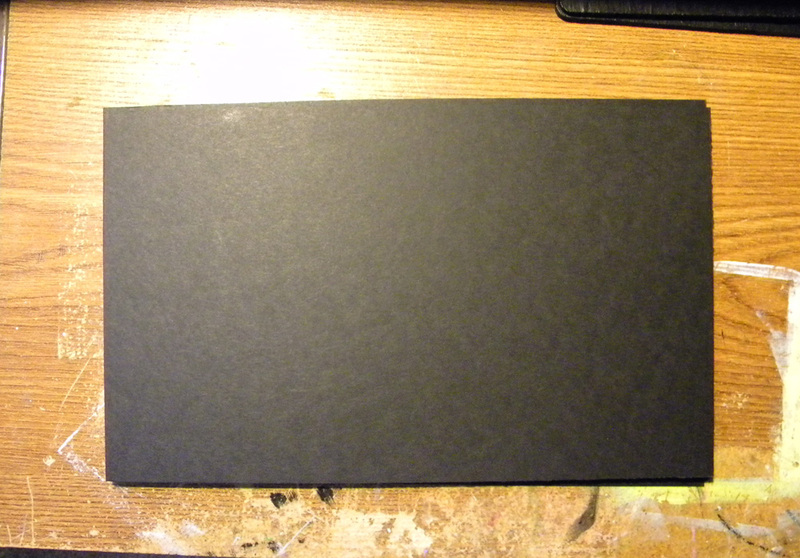 I know people are probably wondering...What do I use on the black card stock you made your book out of? Well I have a picture of some of some of the things that I use. At the top of the left hand paper I used a silver gel pen, that didn't work very well and it's tough to see. 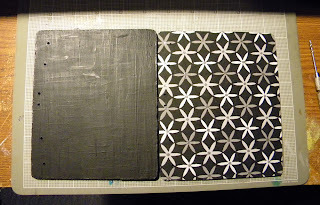 Under that I used a white Gelly Roll gel pen and that is a nice bright white against the black. Just under that is a ordinary white colored pencil followed by a orange Signo uni-ball pen and another colored pencil, this one yellow. 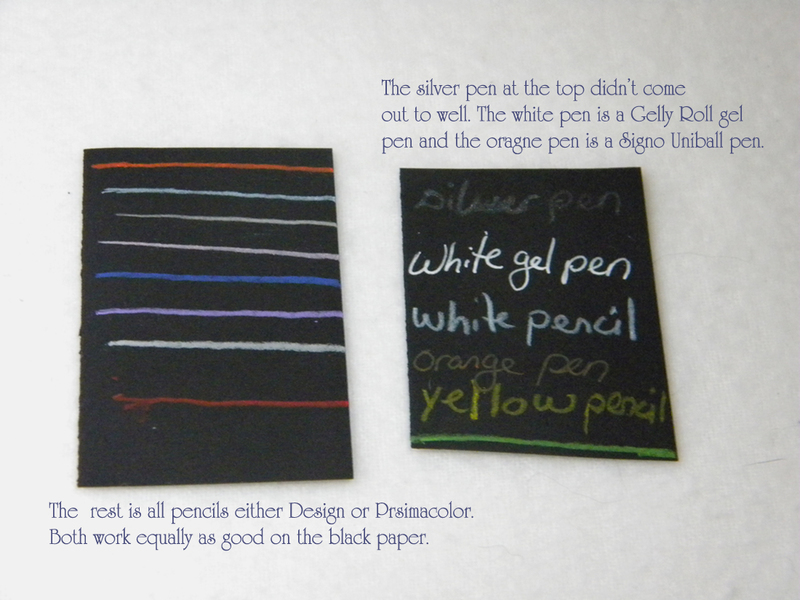 The paper to the left is all colored pencils from both Design and Prismacolor. 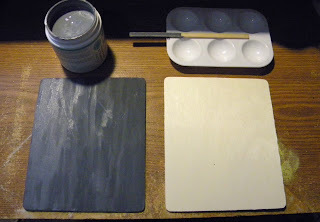 I would also imagine that pastels would work as well on the black paper but I did not have any handy to try it out. OMG! Let me start off by telling you I had the most amazing thing to eat yesterday, and by amazing I mean so not healthy for you. It's called a dirt bomb and I could eat a dozen of them. I got it from a little place in the village called Blue Squid. When I was in there a little dome sat over these things with a label on it that read "Dirt Bomb." Hmmm...curiosity set in and come to find out a "Dirt Bomb" is a doughnut that's been baked in a muffin tin (not to bad right....here comes the not so good for you but wickedly tasty part,) dipped in butter and dredged in cinnamon and sugar. All I can say is AMAZING!!!! I spit one with hubs in the car and immediately wished we would have bought all that were under the glass dome. So if you're ever down in the village (Olde Mystick Village) give up the diet for one day stop by there and grab one of these amazing little things. Now for today's crafty creative little bit, well it's actually quite a bit. I conditioned the chalkboard paint, works great by the way, and drilled holes in the wood for where it will be bound. I cut out paper for the pages, I choose a heavy black card stock. I figured I'd go for an artsy sort of book. One for chalk (hence the chalkboard cover,) gel pens, pastels and the like that really pop on black paper. I folded them and they are being pressed right now. 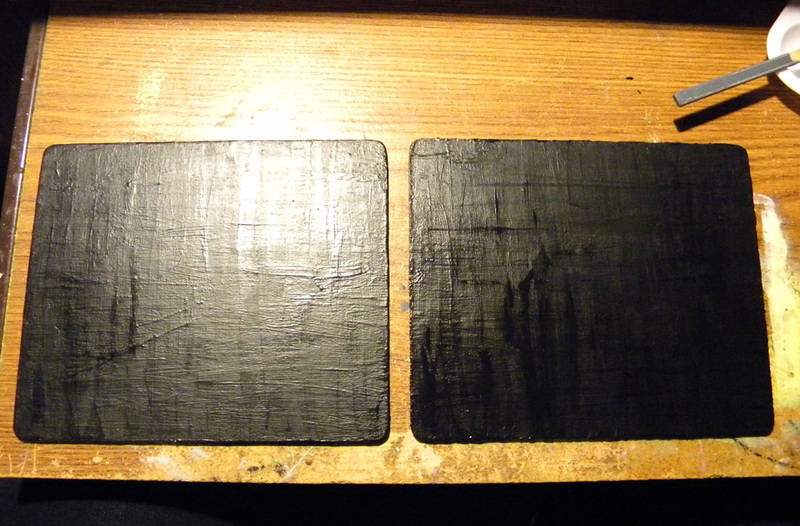 Today I continued to work on the wood book cover. 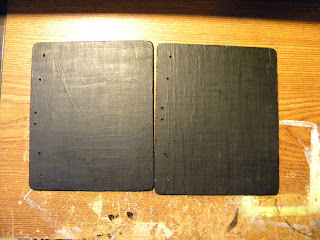 I've never worked with wood but I imagine it won't be much different than working with book boards. I let the last of four coats of the magnetic paint dry over night. I'm satisfied with the fourth coat. The attraction is better I probably could have gone for a fifth but like I said I'm satisfied with four. 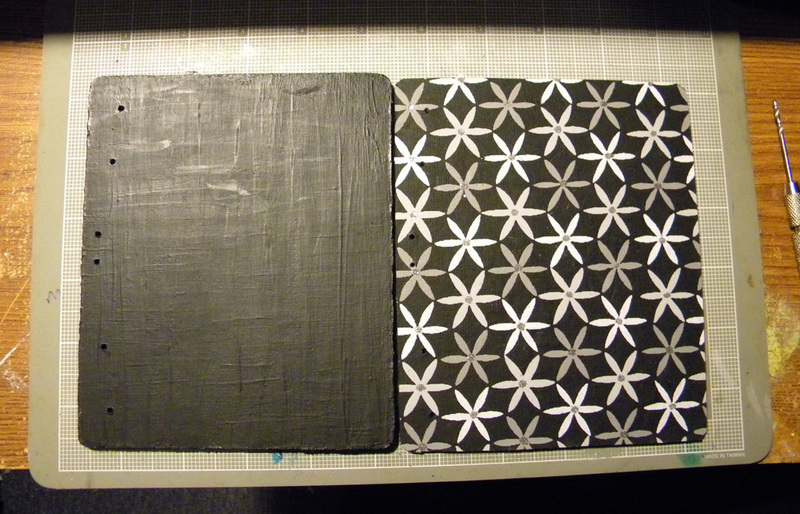 Tonight I painted over the magnetic paint with a black paint. 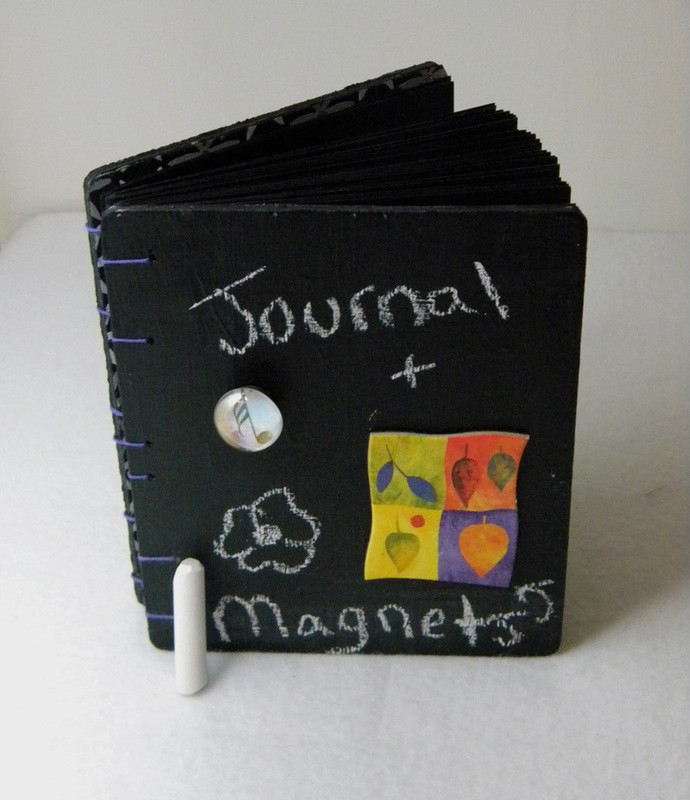 I chose a black craft smart® chalkboard paint to cover the magnetic paint. That's right the cover of this book is going to be a magnetic black board. :) This chalkboard paint has similar instructions to the magnetic. Dry one hour between coats, (again it didn't take an hour to dry,) 2 coats of paint one in each direction and let it cure for 24 hours. The paint at first seems thin and I wasn't sure how it would cover. Though painting over a dark grey I'm sure helped. It did take the two coats to get even coverage and even now I'm debating on a third coat. It's now drying for the 24 hours and we'll see tomorrow how it conditions when the time comes. Today I tried to do some paper casting. 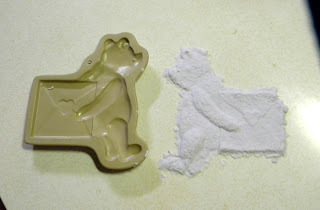 I figured that since the pulp is easy enough to make and I had a stone cookie mold I would give it a go. I made some pulp pressed it in the cookie mold, squeezed some of the water out and popped it out of the mold. I can't say that I'm happy with it. I will have to get some clay additive to add to the pulp next time and I'd also like to get a deeper grooved cookie mold so that the details come out better. This one came out okay. It's not smooth which the clay additive will help with and I think I need to press the pulp down a bit more. I was afraid I was going to press it right out of the mold but we'll see how it drys tomorrow. I'm going to let it air dry over night and see what it's like tomorrow. In the picture you can see the cookie mold with the paper casting next to it. I accidentally took off the corner to the envelope trying to get it out of the mold. Burrr...It's a cold one out there. The weather says that it's 17°F and feels like 7°F out there. It's been snowing all day today and there is lots of the fluffy white stuff. Personally at this point in the year I was hoping for no snow. I'd rather see the white stuff for Christmas and New Year, not now. 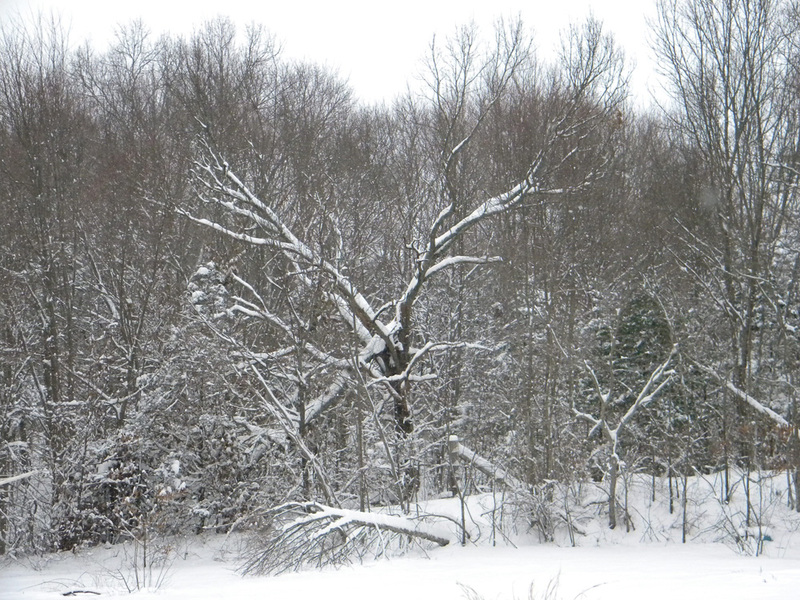 I have to say that it does look nice outside with the fresh snow. No brown dirty melty nasty looking snow in site, the plows and sand trucks haven't been by yet. I've only been outside twice to shovel around the cars so the plow guy can plow out the drive, and that was enough work for me. I'm still wondering what happened to the 3-5 inches we were suppose to get, I'd say we got quite a bit more than that. Today I took a spiral bound journal ripped it apart and recovered it, embellished it and made a video of the process I used to do it. :) So here it is. I love these certain shells that I love. I call them shiny shells. They are Jingle Shells aka Mermaid Toenails. 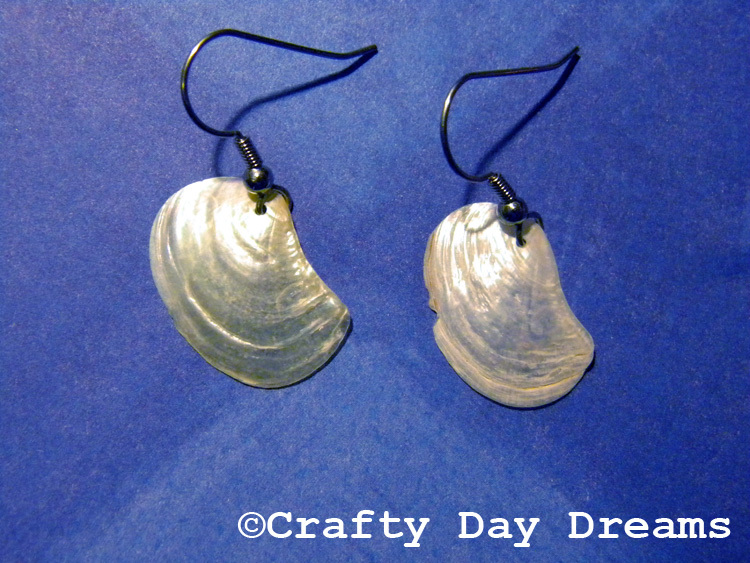 They come in a variety of colors and are a type of clam shell. I've found them in orange, yellow and white. They are small colorful and shiny. Who doesn't like shiny things? 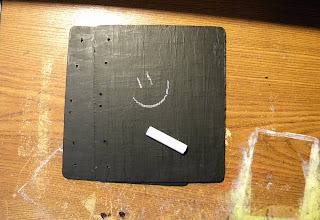 I took a small drill bit in a pin vice and drilled holes in them. I opened the the loop at the end of a set of hook earrings and put them though the hole in the shell...closed the loop back up and you got a pair of shell earrings. The snow is gone but the wind has come and made it very cold. 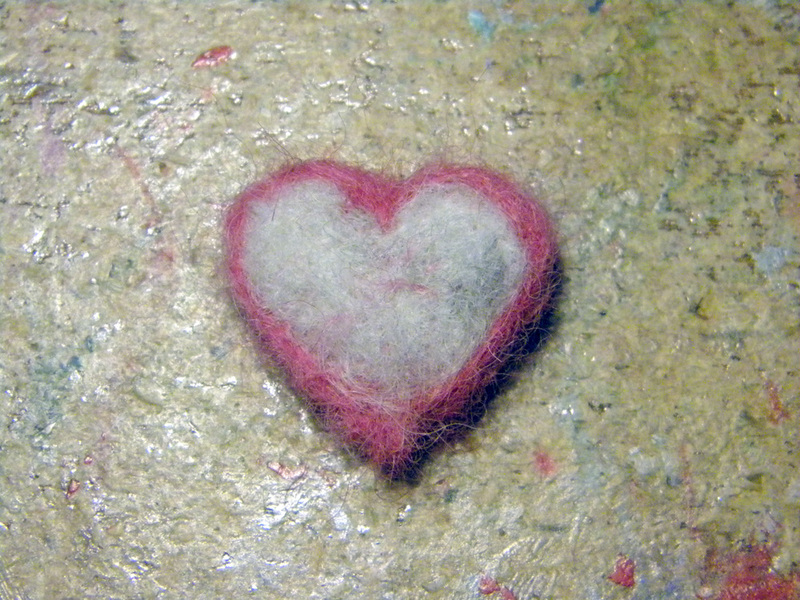 Staying inside today hubby found an box of wonderful things that we found at the beach. Some shiny rocks, (the kids love those shiny things and they have an infatuation with rocks,) some nice big pieces of sea glass, (do you smell the smoke from the wheels turning in my head?) and of course a ton more shell. I probably have enough shells to open a small shell shop by the seashore...hehe. No all kidding a side I really do. I have boxes and containers and baskets and bottles full of shells...One day I'll have to take some pictures of some of the collection. I think its all that wanting to live on the beach that's got me hording away all of the wonderful treasures I find when I'm there. I have got to find a way to put all these shells to use. Snail shells are a popular one. I have some of those and conch shells, tons of little itty bitty conch shells. I have a conch shell that's so tiny it will sit on the tip of a pencil. Don't ask how I found that one because I'd swear I was blind but I have it somewhere in one of the containers. Want to hear a funny story...well not so funny for me...One of my stays at the beach I found this really nice conch shell. It was big, beautiful and all intact. I spotted it floating in on the waves just out a few feet in the water. I immediately went for it. Turning it over to make sure no snail was in there and it was all clear. I was in my glory. I had found the best shell ever. It had a few barnacles on it but those would be no problem to get off. I put it in my bucket along with all the other things the kids had collected and brought it back to the house. Later that night I wanted to clean off all the days findings so I put a pot of water on the stove to boil. Once boiling I added the shells to clean them. The first one I cleaned off was my beautiful conch. I scraped the barnacles off the outside and when to go scrape the sand out of the inside and make sure it was clean all the way down in. Sticking a skewer in the shell it felt like there it wasn't going in as far as it should. There was something stopping it. A big barnacle I figured. Oh did I figure wrong. I was all like "What the hell's stuck up there?" I started jabbing and shaking. I gave it a nice hard shake and this cooked pink hermit crab flew out and into the sink. I screamed and dropped the shell, jumped back about ten feet from where the poor hermit crab lay dead in the sink. My hubby started laughing at me. I was in hysterics. I felt so bad. I swear I checked that shell good before I put it in the bucket...no crab ever poked out at any point in time. I still feel bad to this day for killing the poor, poor hermit crab. Lesson learned...poke shells good first or give them time before you stick them in your bucket. 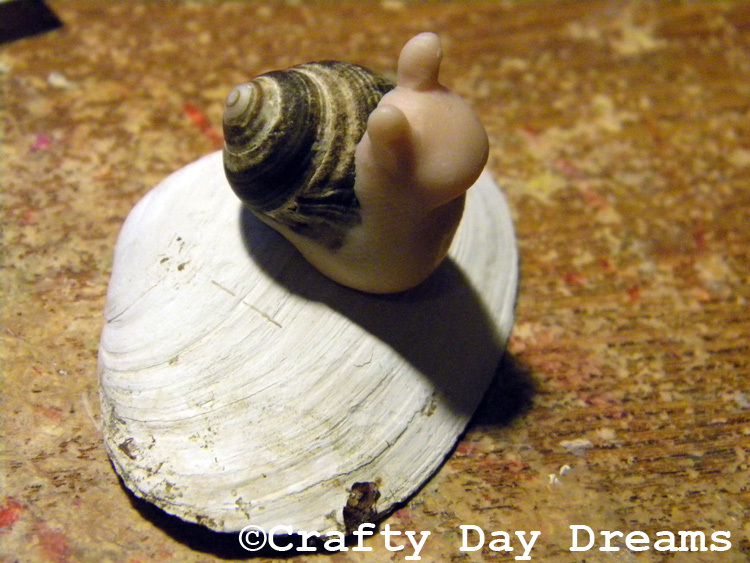 So with all those shells I figured I'd start off and use a snail shell to start and do some sculpting. I haven't done any sculpting in a long time. It's been a few years. 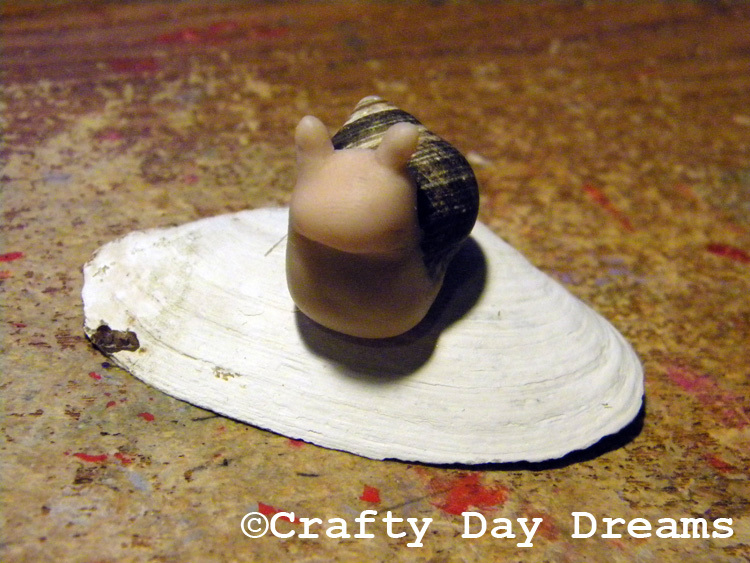 I took some Super Sculpey and made a snail in his shell. I'll back him tomorrow and maybe paint him. Today we woke up to the five a.m. phone calls from the schools saying that there was a two hour delay. At least they had school. Though a two hour delay throws off the whole darn day. Nothing like getting the last kid off and have the oldest show up only hours later. It leaves little time for anything during the day. 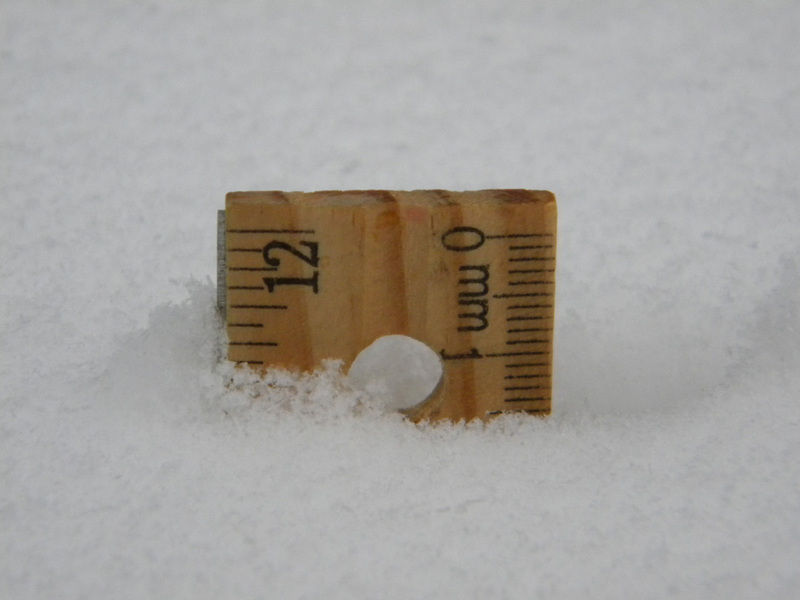 All that for like two to three inches of snow. My gosh you'd think we had a blizzard. Was it not just last year we were buried in the white stuff. The snow piles in the drive where taller than me. Anyway I think the snow finally killed the leeks. I didn't make it out to the garden today to look but I also didn't see any standing up. The celery is covered so for all I know it is still alive. 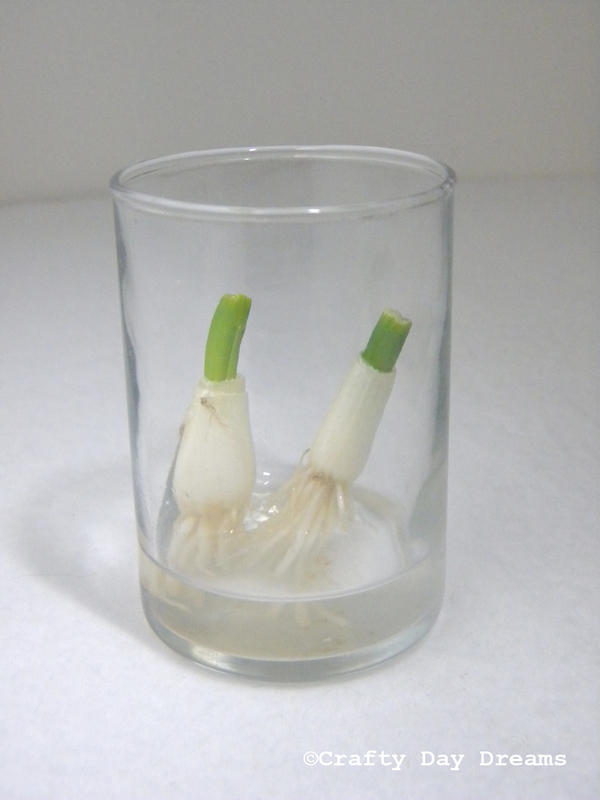 I'm going to try my hardest to get it to the next growing season. My flowers in my flower bed look sad now with the snow on them. They were still nice and green. Heck I had a flower out there about two weeks ago. Now they look cold and sad. All this had me thinking spring and how I can't wait for it to come. I'm excited about getting the garden ready and staring it. I went out to check the compost barrel the other day and would you believe a family of mice built a nest in it. They dug a tunnel from the outside all the way up to the top of the compost. I just added some things to their house, I hope they like it. Mostly paper but I'll have a some house scraps soon for them too. I plan on ordering my seeds soon and getting my veggie CSA for the new season soon too. I'm going to try starting my own seeds this year. This will be a feat for me to do as most plants in the house usually die fast. I blame the hot air heat on that but it could be the cats eating them/digging at them, or just my sheer lack of remembering to water them, either way it's not going to be easy to do but I'm going to try my hardest. 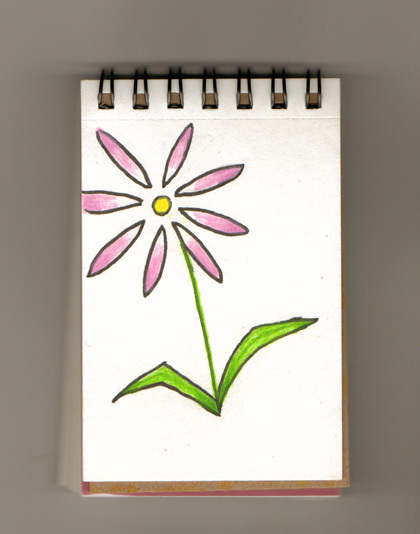 Thinking about spring today I came up with a drawing of a flower for today's creative bit. Drew it in pencil, inked it with archival ink, and colored it with Prismacolor colored pencils. I hope you like it. It never seems to me that I ever have a day when I can do absolutely nothing, nada, zip, zilch. I spent today coloring cards and tomorrow I'll do the same. There's a lot of them to color. So much so that I haven't been really making anything for my shops. The kiddos were home today from school and they will be going back tomorrow. I say that because we are under a winter weather advisory for tonight into tomorrow morning and they will be going to school tomorrow. I will not get the five o'clock in the morning phone calls from the schools saying that there is a delay or no school. It's just not going to happen. I want a day where I can sit in the tub with a good book and a glass of wine.....oh wait...that's not real...only in my dreams. It is a nice dream though. A few things I did change. One was that I didn't use a credit card. I tried to in the beginning and got as far as bending the thing and it snapped so instead I used and old insurance card that I still had laying around. It's one of those thick plastic coated paper ones. It worked out really well. I didn't use any scotch tape just making tape, painted it with acrylics and sealed it with a gloss sealer. I didn't use dirt or plants in it...it's winter and the hot air heat kills plants really fast so I put some dried ferns in it. I went for a smuggy worn look to mine. The yellow paint ran a bit when I put the sealer on but I'm okay with that..I like it that way. I recently started watching the show Merlin and I love it. I've always like the fantasy theme; unicorns, witches, wizards, magic and mystery. So I figured I go and do a series of collections on ArtFire. Today's collection is on Witches and Wizards. Day 14 - A rug? Day 6 - The coolest bag clip ever! New Year and New Things.